Lying isn’t always done with ulterior motives. When your preschooler starts lying, it’s simply a new developmental milestone, according to research by Kang Lee, a University of Toronto professor and director of the Institute of Child Study. This shift signifies changes in the way your child organizes information. It’s a normal step, so you don’t need to worry about your little one becoming a pathological liar. 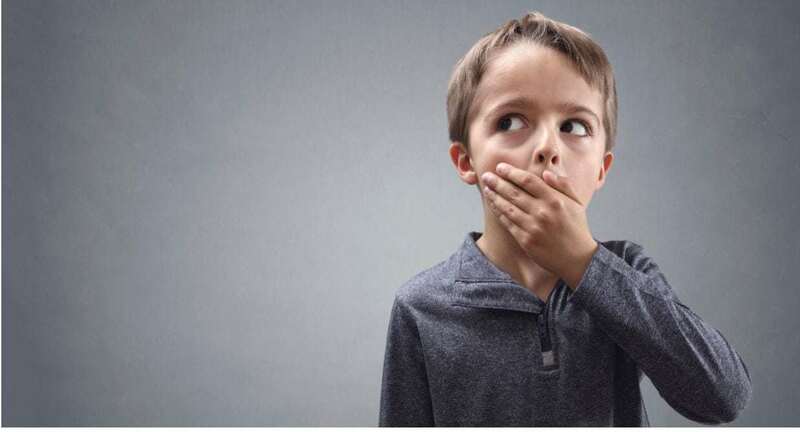 The study shows that lying is common from age 4 to 17, and by age 7, kids can tell a lie so well that often their parents can’t even tell they’re being untruthful. But after age 17, lying decreases – so it’s not necessarily a problem that will follow our kids into adulthood. That said, many times kids do have a legitimate reason for stretching the truth – they want to avoid punishment, disappointing their parents or an unpleasant outcome. Would you be honest if you knew it would cause you humiliation, a lecture, a punishment or being yelled at? It’s hard for a child to tell the truth when they know those will be the outcomes. Your child doesn’t want to disappoint you, either. So they may fib about a poor choice they made or make up ridiculous stories to impress you. And naturally, when our kids blatantly lie to us, we want to punish them to make sure it doesn’t happen again. Unfortunately, that’s exactly what happens – when we punish kids for lying, they’ll keep doing it in the hopes of avoiding any future punishment. So if we can’t punish them, how do we put a stop to the lies? Keeping in mind the reasons why kids lie, we can create an environment where they feel safe telling the truth. The following seven tips can help you make your home a more honest place. 1. Keep calm and parent on. Watch how you respond to misbehavior and mistakes in your home, whether it’s spilled juice on the carpet or unfinished chores. If your kids worry about being yelled at or punished when they mess up, they won’t want to come to you with the truth. Focus on using a calm voice – yes, it can be tough, but it’s possible. That doesn’t mean kids are off the hook for lying. But instead of getting angry and assigning blame, discuss solutions to the problem with your child. 2. Don’t set up a lie. This can help head off a power struggle and allows your child to save face by focusing on a plan of action instead of fabricating an excuse. It also teaches a lesson of what they can do next time – sitting down with homework right after school or taking off their shoes in the mudroom instead of the living room – to avoid problems. While we may want to put our child on the spot when we catch them in a lie, accusing or blaming them will only make things worse. Getting to the root of the problem and understanding why she couldn’t be honest with you will help you encourage your child to tell the truth in the future. Open up a conversation gently, saying, “that sounds like a story to me. You must be worried about something and afraid to tell the truth. Let’s talk about that. What would help you be honest?” You can use the information you glean to help her be more truthful in the future. Even if you’re upset that there’s a sea of water on the bathroom floor because your daughter tried to give her dolls a bath in the sink, commend her for coming to you and telling the truth. Think of mistakes as a way to learn how to make better choices. When we stay calm and avoid yelling or punishing our kids for mistakes, our kids will be more likely to admit their slip-ups in the future. Turn the mistake into a learning opportunity. Ask, “If you could have a do-over, what would you do differently?” and brainstorm different ideas. If someone else was affected – maybe he broke his sister’s scooter – ask what he can do to make it right with the other party. Let your kids know you love them unconditionally, even when they make mistakes. Make sure they know that while you don’t like their poor behavior, you will never love them any less because of the mistakes they might make. This helps your kids feel safe opening up to you. Remember that your kids are always looking to you and learning from your actions. Those little white lies we tell, whether it’s to get out of dog sitting for the neighbors or helping with the school fundraiser, aren’t harmless – they’re showing your kids that it’s okay to lie. These tips will help start your family on a path for a more honest household. But remember it takes time to build up trust. Be patient. However, if your child continues to lie often or lies with the intention of hurting others, you may want to consider counseling or other professional help. I also teach may other strategies to encourage honesty in my my online parenting course. If you want to see if it’s a good fit for your family, I’d love for you to JOIN ME FOR A FREE ONLINE CLASS. Creating an environment where kids feel safe telling the truth not only cuts down on lying day to day, but it helps your child build character traits that will serve her throughout adulthood.